Point Pleasant sophomore Sami Saunders (6) goes up for a spike attempt during Game 2 of Tuesday night’s volleyball match against Hannan in Point Pleasant, W.Va.
Hannan freshman Tonika Coleman hits a serve during Game 3 of Tuesday night’s volleyball match against Point Pleasant in Point Pleasant, W.Va.
POINT PLEASANT, W.Va. — The post-match punch wasn’t spiked, which was more than the opposition could say. 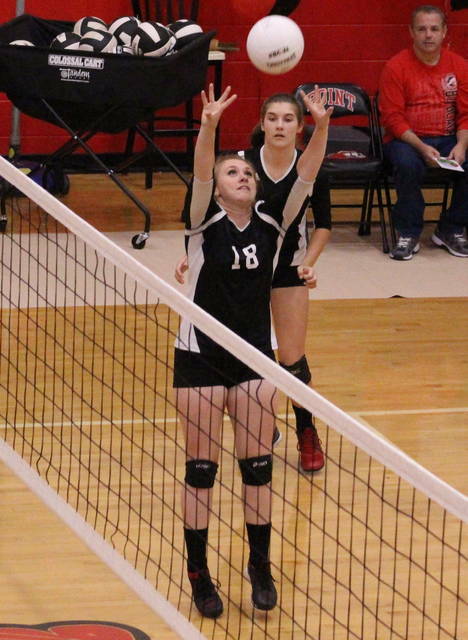 The Point Pleasant volleyball team celebrated Senior Night in style after posting 31 kills Tuesday night during a convincing 25-7, 25-2, 25-8 victory over visiting Hannan in a battle between Mason County programs. 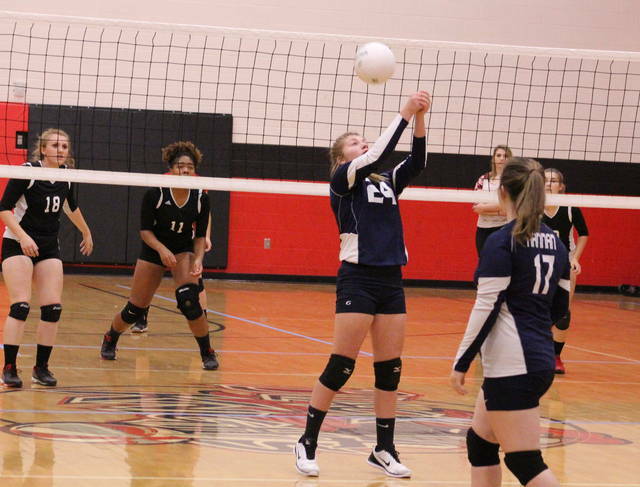 The Lady Knights (17-3) never trailed in the match as the hosts recorded at least eight kills in each game en route to the wire-to-wire triumph. The Red and Black picked up their fifth straight win and also claimed a season sweep of the Lady Cats (3-16) after posting a 3-0 decision in Ashton back on Sept. 21. The Blue and White, conversely, dropped their fourth consecutive overall decision. Point Pleasant honored four seniors — Gracie Cottrill, Brenna Dotson, Mackenzie Freeman and exchange student Maria Da Costa — before the contest, then the hosts rode that momentum into Game 1 after jumping out to early leads of 4-0 and 9-1. 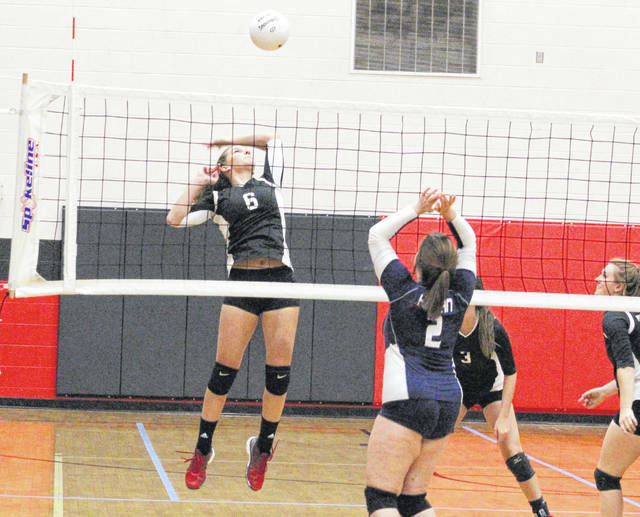 The Lady Cats were never closer than 9-2 from there as PPHS reeled off 16 of the final 21 points — including the final four points — en route to an 18-point win and a 1-0 match advantage. After recording 13 kills in the opener, the Lady Knights had their lowest output of eight kills in Game 2 — but it had more to do with their efforts at the service line. 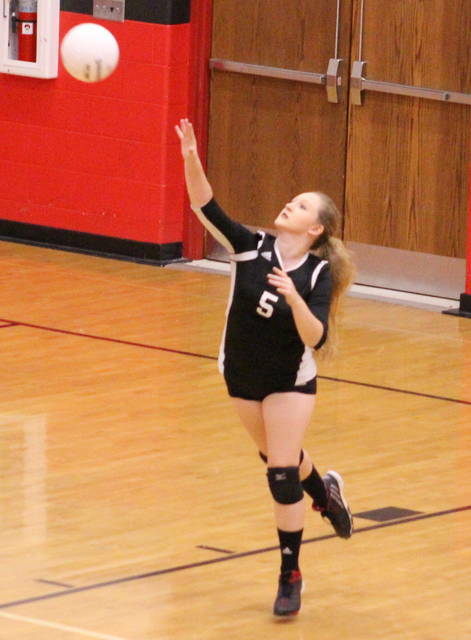 Cottrill served up 16 consecutive points — which included eight aces — before HHS managed to break serve. The guests found themselves in an 18-2 hole before Peyton Jordan served up the final seven points as Point Peasant wrapped up the 23-point win and a 2-0 match edge. Hannan cut the Game 3 lead to 2-1 early on, but Freeman reeled off 13 consecutive service points after Point broke serve — allowing the hosts to secure a 16-1 cushion. The Lady Cats rallied back to within a dozen points at 17-5, but the Lady Knights followed by scoring eight of the final 11 points en route to the straight-game decision. The night couldn’t have gone much smoother for Point Pleasant, something that made PPHS coach Marla Cottrill very proud of afterwards. As she noted, it was a night that her upperclassmen deserved after years of battling to get better as a program. “The seniors, I just cannot say enough about them,” Cottrill said. “It’s my third season with them at the high school level and they’ve been really good leaders. They’ve been a big part of our program’s growth over the last four years and I’m very happy that they could enjoy their final home match. They’ve been a pleasure. Conversely, interim HHS coach Frankie Hudnall didn’t have anything to add about the evening — except noting that Point Pleasant has a fine team and played very well on Tuesday night. Cottrill led the Point Pleasant service attack with 23 points and nine aces, followed by Freeman with 17 points and Jordan with 12 points. Madison Hatfield was next with four points, while Olivia Dotson and Brenna Dotson respectively chipped in two points and one point. Jordan and Hatfield each recorded two aces, while Freeman and both Dotsons added an ace apiece. Lanea Cochran led the net attack with 16 kills, with half of those coming in Game 3. Brenna Dotson was next with six kills, while Olivia Dotson contributed five kills. Tristan Wilson was next with two kills, while Haley Milhoan and Sami Saunders also had a kill each. 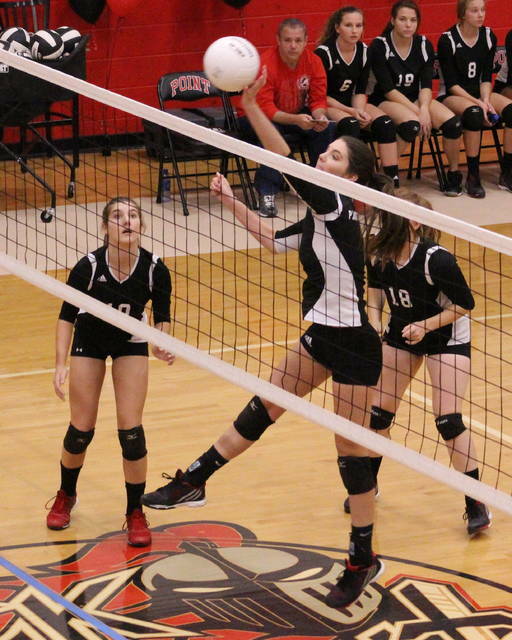 Cochran recorded a team-high two blocks and Olivia Dotson also had a block for the victors. McKenzie McQueen led Hannan with two service points, the only points the guests produced in the match. 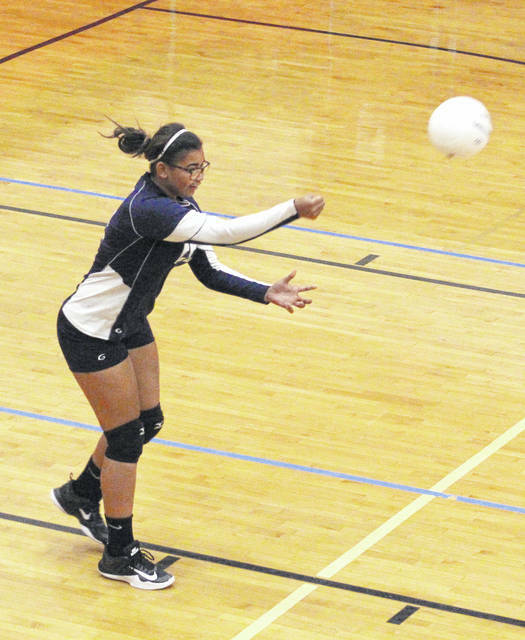 Josie McCoy also had one block in the setback. Both teams complete regular season play on Thursday at 6 p.m. Point Pleasant travels to Parkersburg Catholic, while the Lady Cats head to Buffalo. Hannan will open Class A sectional play on Monday when it travels to Buffalo High School for a 5 p.m. opening-round match against a yet-to-be-determined opponent. Point Pleasant will host the Class AA Region 4, Section 1 tournament next week and opens postseason play at 7 p.m. Tuesday against Nitro.